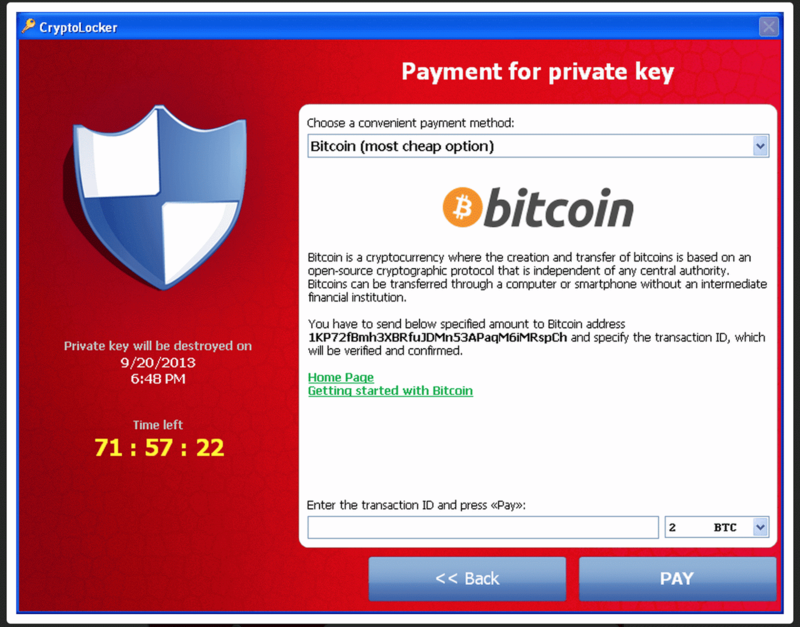 We've all heard of the famous Cryptolocker, and if not, it is definitely something you should be aware of. Cryptolocker is known for infiltrating your computer or device, locking down your stored files in some way and threatening to delete them if you do not meet their demands. The demands typically come in the form of money using a prepaid card or Bitcoin. Victims are given a time limit to meet the demands before their files are lost. Sound scary enough? The question then is; how do you avoid this? Ransomware is exactly what it sounds like; it holds your computer files hostage where you, the victim, need to pay a costly ransom to get it back or your data will be lost forever. Victims are given no other choice as ransomware was made to launder money, and to rake in a profit. Payments must be made on a browser like Tor, but in most cases, on a generic browser over an unencrypted network. In the case of Cryptolocker, which is now considered obsolete among the various types of ransomware, it encrypts your files making it nearly impossible to recover your files as decrypting the algorithm takes time and loads of computing power. Fortunately, there's already been a fix to Cryptolocker, and it's possible to get rid of it, but there are many ways to avoid things like this in the future - and it's much simpler than you think. There are over a dozen varieties of ransomware (Locky, Zepto, CryptXXX) and for most of them, there's no easy fix. Always check if a site where you're inputting login data has SSL enabled or not - this can be verified by a lock in the top right of your searchbar, or by a green searchbar. In our case, Crypto-Games has SSL enabled, so there's almost no risk of your data being tampered with as long as you've confirmed that the site is indeed Crypto-Games and is not a scam site. Next, look at the URL and check if it's spelled correctly. Some sites will take advantage of a typo and advertise themselves on other websites or even on Google - one example of this was http://blockchian.info, a phishing site that was designed to take passwords and usernames of Blockchain.info users. Notice that it's spelled Blockchian and not Blockchain. While it may seem insignificant, Blockchain.info and Blockchian.info lead to two very different sites. Never answer an eMail or chat message from anybody pretending to be from Crypto-Games that seems out of place. We will never ask you for your password! Just to double-check, visit our official Twitter at https://twitter.com/crypto_games we'll keep you posted on any breaches or incidents there. How has this affected Bitcoin? Many new forms of ransomware do not have a 'cure' yet - you won't be able to remove the ransomware in most cases. This is a good reason why you should always backup all of your files, and sometimes even your whole computer. If you fall prey to one of these traps, you can always restore your documents and programs and you'll essentially have lost nothing. It can sometimes be annoying, but it's well worth the time - security is your first priority. We recommend using external drives for backup; they provide the quickest file transfer speed, which sometimes is irrelevant, but it may matter in this scenario. Larger backups may take longer periods of time. You can also use smaller drives from more essential files or files that need to be readily accessible for another level of redundancy. Many new forms of ransomware do not have a 'cure' yet - you won't be able to remove the ransomware in most cases. This is a good reason why you should always backup all of your files, and sometimes even your whole computer - if you fall prey to one of these traps, you can always restore your documents and programs and you'll essentially have lost nothing. It can sometimes be annoying, but it's well worth the time - security is your first priority. We recommend using external drives for backup; they provide the quickest file transfer speed, which sometimes is irrelevant, but matters in this scenario. Larger backups may take longer periods of time, although you can store additional files on smaller flash drives, which can be more convenient but offer much less storage space for the most part. Ransomware can be potentially devastating if you store valuable documents on your computer. This is why it is a good idea to always back up your computer to ensure that you'll have minimal losses if something does happen. While nobody thinks it'll happen to them, it could potentially attack you and you could lose a lot of money. We hope this guide has helped you out in some way or form; it doesn't only apply to ransomware, but to malware in general.